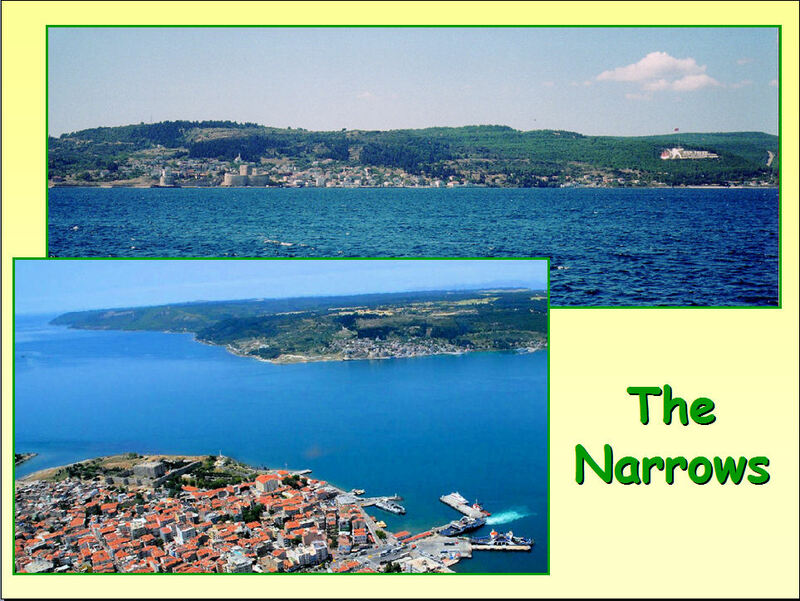 the Dardanelles . 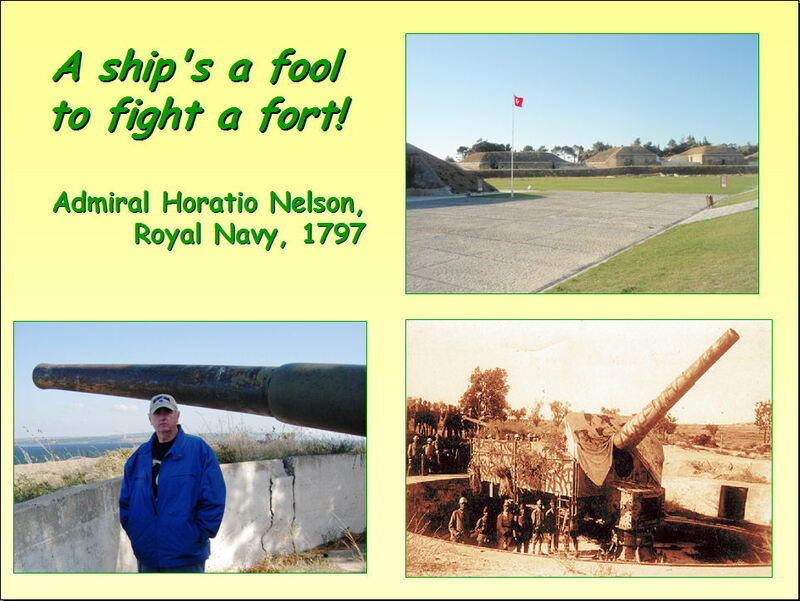 . .
Obviously, Sir Winston changed his mind four years later, despite Horatio Nelson, greatest admiral of the Royal Navy, having advised against ships engaging fortifications. Lord Nelson had considerably more experience in such matters than the First Lord of the Admiralty. Nonetheless, the first phase of the Allied assault against the Dardanelles involved a major fleet effort to eliminate the numerous forts, open and mobile batteries, and old castles with modern artillery installed, all arrayed along the straits. Eighteen battleships with their enormous main batteries, supplemented at times by Marine landing parties apparently seemed sufficient to the naval planners for the mission. Also, the decision makers felt the mines planted in the straits were a solvable problem. However, it was the combination of the fort and the artillery that was to prove unsolvable. These views, above and below, give a sense of the distances involved and the tactical situation on 18 March. The Turkish guns were considered too old, too exposed, and of too small a caliber to threaten the heavily armored ships. However, I have visited many of the sites, and the positions were numerous and all very well sited, with commanding views of the straits. The decisive blow against the British and French armada, though, came due to a passive defense—mines. Beginning where the width Dardanelles decreases from its maximum 7 km to 1.6 km at the Narrows, ten rows of naval mines were laid just below the surface perpendicular to the straits. The Royal Navy knew all about these. They just needed to be swept away to allow the fleet to advance. But the forts on shore prevented the mine sweepers from doing their work, so the battleships in rows of four were sent in to take turns pounding the forts. After firing, each row was to turn starboard toward the Asian side, where an indentation on the shoreline provided a turning basin for moving to the rear. Unbeknownst to the Allied naval command, however, was the work of the German-built minelayer Nusrat. 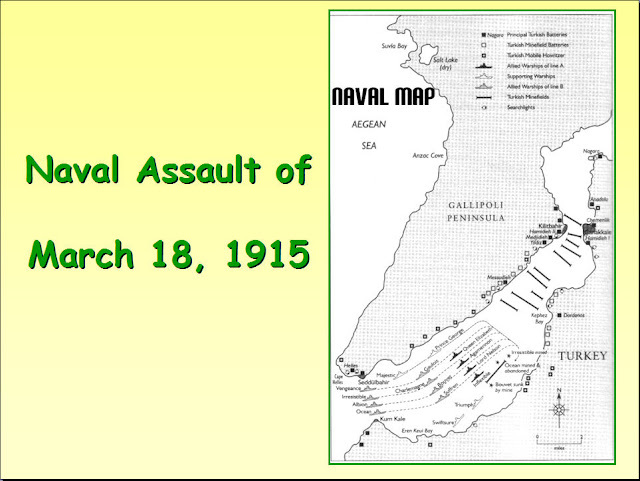 On the night of 7/8 March 1915, with Capt. 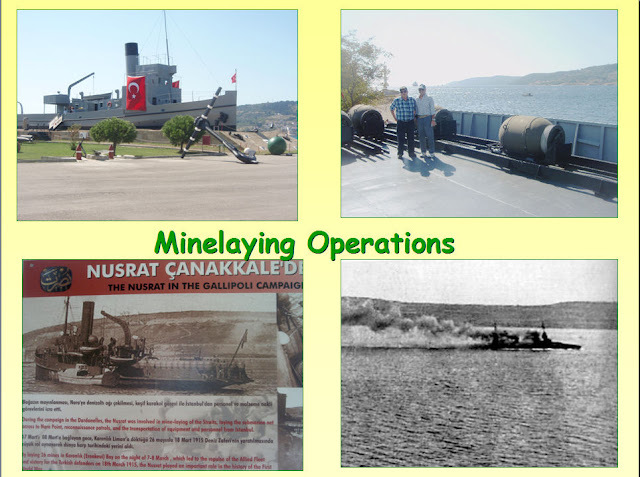 Hakki Bey in command, Nusrat ventured out in the silence and darkness from Çanakkale and parallel to shore laid the 26 remaining available mines (in what was to prove the fleet's critical turning area near the Asian shore). Naval and air reconnaissance failed to discover these mines. In quick succession here on March 18, the Royal Navy lost HMS Ocean and Irresistible and the French Navy the Bouvet. Three other battleships were seriously damaged from mines or in the exchange of gunfire. These undreamt-of losses utterly demoralized the naval staff, and a land campaign was initiated—one that the Turkish Army was confident it could defeat. During my visits to Gallipoli I have discovered that the Turks have a completely different view of the 1915 campaign than that presented in English-language sources. 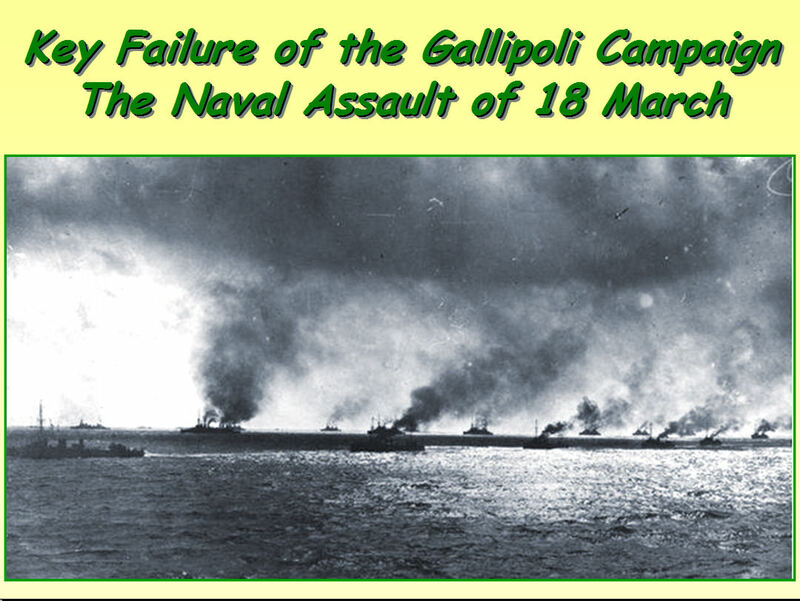 They believe that after the main naval assault of 18 March failed they had defeated the Allies because they could subsequently deploy enough forces to Gallipoli Peninsula or the Asiatic side to foil any effort to control the straits or march overland on Constantinople. Enver Pasha declared this to be the case at the time, and, for once, his instincts were correct. "March 18, 1915" is Turkey's equivalent to Anzac Day—but a victory day, proclaimed as such in a large sign on a hill overlooking Çanakkale, and the name that is given to the local university. 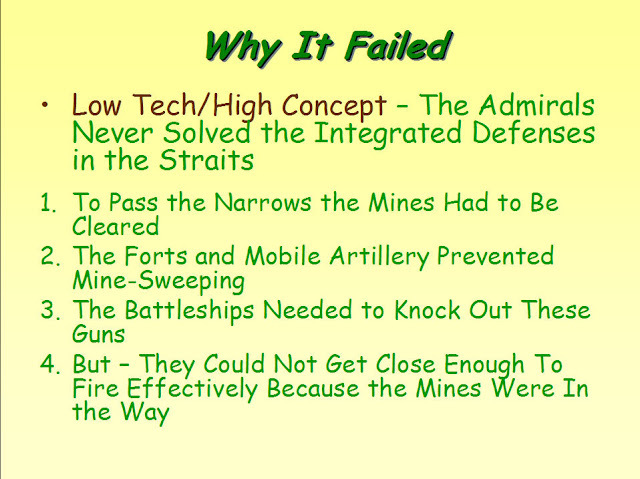 You have identified the tactical reasons for the failure. But don't ignore the fundamental error of the campaign. The coal-fired ships in the British and French battle fleet would, if unopposed, use so much fuel ascending the Dardanelles that, upon arrival in Constantinople, they would have only enough in reserve to stay three days without being refueled. If the Turks allowed the ships to pass unopposed, they could then turn their field artillery on the unarmored colliers attempting to resupply the fleet. In short, the strategy relied on the assumption that Turkey and the Ottoman Empire would surrender immediately upon arrival of the Allied fleet. Stalling by Turkey for 72 hours would have defeated the Allies! The campaign was doomed from the start, if Turkey showed resistance. Which it did, magnificently, for the rest of 1915 at Gallipoli. "We Are the Don Cossacks—We Do Not Surrender!"